Visiting San Diego for some fun in the sun? San Diego is a great vacation destination in Southern California, with the warmest water and best beaches in California. We can recommend some great San Diego beach hotels and other nice places to stay. We have hotels, resorts, beach homes, beach rentals, condos, villas, cheap hotels, bed and breakfast inns, campsites - many types of San Diego beach rentals to fit your San Diego vacation and budget. The north San Diego coast includes the beach communities of Del Mar, Solana Beach, Cardiff-by-the-Sea, Encinitas, Leucadia, Carlsbad, and Oceanside. It has some large popular beaches and smaller hidden beaches, with smaller crowds than you will find further south in San Diego city beaches. If you are visiting Legoland, Disneyland (~70 miles further north in Orange County), or want a quieter stay, consider one of the North San Diego hotels or resorts. San Diego includes the beach communities of Torrey Pines, La Jolla, Pacific Beach, Mission Beach, Ocean Beach, Coronado, and Imperial Beach. It has many large popular beaches, and the San Diego nightlife. If you are visiting the San Diego Zoo, SeaWorld, Balboa Park, or UCSD, consider one of the San Diego hotels or resorts. Are you looking for a luxury resort beach hotel? 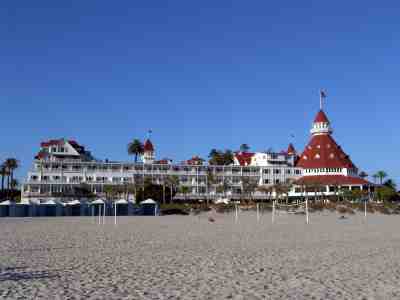 San Diego has some lovely beach front Coronado resorts, Del Mar resorts and San Diego Beach Resorts. Check out these great Beach Resorts in San Diego. There are nice Resort Hotels in San Diego that are close to the beach, but aren't right on the sandy beach. Most are near San Diego golf courses, and many have fantastic views of the Pacific Ocean. If you want a San Diego CA hotel resort, but not one right on the sandy beach, check out these Resorts in San Diego for your Southern California resort vacation! 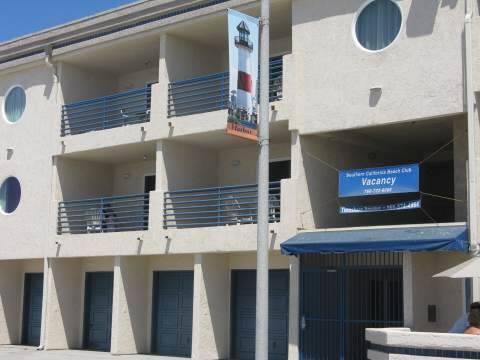 Here are some great San Diego beach rental hotels in San Diego county. If you are looking for cheap hotels in San Diego CA, check out some suggestions for finding cheap hotel rates in San Diego. 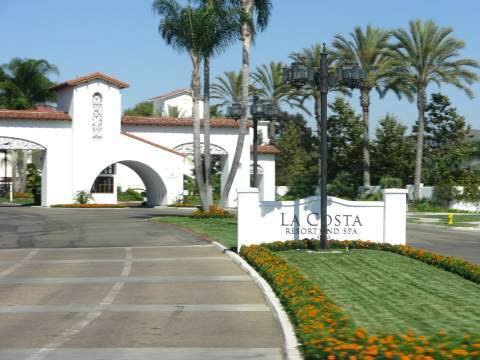 Are you looking for a San Diego vacation rental, such as a vacation home or condo? There are many beach front vacation homes or condos near most of the San Diego beaches, that typically rent by the week. To find a variety of San Diego vacation rentals, click on the link above. Consider a San Diego Bed and Breakfast for your romantic San Diego vacation. A charming San Diego North County Bed & Breakfast is the Inn at Moonlight Beach. Four rooms, with the Penthouse suite featuring a private deck with hot tub overlooking the Pacific Ocean. A five minute walk to Moonlight Beach, the most popular beach in Encinitas. Looking for cheap San Diego beach rentals? 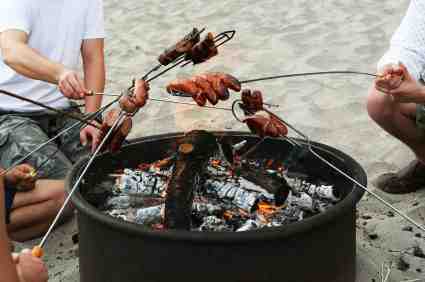 Consider San Diego Beach Camping. Beach camping in San Diego is a unique experience, allowing you plenty of time to swim, surf, and enjoy the picturesque San Diego Sunsets. Both RV and tent camping are available at the San Diego state beaches, and there are also private campgrounds in San Diego near the beach.